Yesterday, the world lost one of its greatest poets: Dr. Maya Angelou. The first poem of Maya Angelou I came across was “Phenomenal Woman,” which really resonated with me. It was read at a bridal shower I attended in Harlem, and I just loved every single word of it. 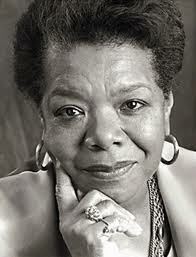 Before that, I had read Maya Angelou’s first book I Know Why The Caged Bird Sings and also watched the movie. Maya Angelou’s life was not easy: she was raped at age 7, a teenage mother at age 17, a restaurant cook, a prostitute, and a pimp. She turned her life around, was a professional dancer, singer, actress, and a journalist in Egypt and Ghana. She won several Grammy awards. She walked with the greats of this world: Malcolm X whom she met while in Ghana and was going to work with before his assassination, Dr. Martin Luther King Jr., James Baldwin, Billie Holiday, Oprah Winfrey, and so many others. President Bill Clinton asked her to read a poem at his inauguration ceremony in 1993, making her the second poet in American history to do so. Her reading of that poem, “On the Pulse of Morning” won a Grammy award. President Obama presented her with the presidential medal of freedom in 2011. She was a professor at Wake Forest University.